Coordinator and Client Service Associate. Caitlin joins us with a financial background, and has worked in the industry for nearly seven years. She started her career working as a teller for a local community bank in the Sacramento region, and quickly worked her way up to a position at the Bank’s corporate office. Her background in finance and passions for event planning and design make her a true asset to our team. 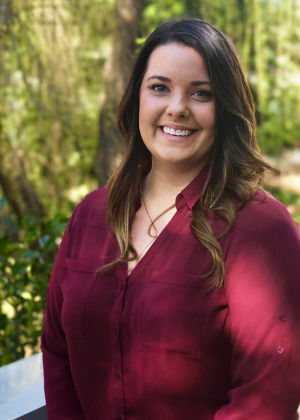 Caitlin got married in September of 2016 and it was through the wedding planning process that she realized her natural talents as an event coordinator. Her true mission is to have a career that never feels like work. After getting married, Caitlin and her husband, Ian, moved back to the area to start their future together as newlyweds and are proud to call Nevada County their home. You will likely see Caitlin hosting and mingling with guests at any of our events, or out in the community serving as a representative for the many local organizations we support. In her spare time, Caitlin enjoys spending quality time with family and friends, cooking, crafting, yoga, traveling, and anything that involves the sun and water.